Being part of a farm makes you really work with the seasons! Take rhubarb. I’ve never actually cooked rhubarb before, as much as I love strawberry rhubarb pie (Briermere Farm in Riverhead makes the best I’ve had!). This vegetable is not part of my Caribbean repertory and, to be honest, I have been a little intimidated by it. Silly me! It is simple! Rhubarb was part of our pick-up for two weeks at Restoration Farm, and I had two quarts of fresh-picked strawberries from our berry share that were in danger of going to waste, so I had to get over myself and act fast. I am so glad I did, thanks to this easy-peasy-lemon-squeezy recipe that originated with Bon Appetit. I tweaked the recipe slightly to fit the amount of strawberries and rhubarb I had. Rhubarb facts: It is a vegetable, but it is used as a fruit. Originally from Asia, its botanical name is Rheum rhabarbarum (which is a really unappealing name, I must say). The stem – the only edible part of the plant – looks a lot like celery with a reddish tint). It is in season in late spring and summer. I didn’t see it in last week’s pick-up, so you’ll need to make this soon. Unlike many jam recipes, this requires no pectin or gelatin, which was a big plus for me, but you need to use it within two weeks unless you take extra preserving steps. Next time, I will plan to preserve the jam so I brighten up some dark winter day with this jewel red sweet-tart jam! In a large bowl, mix strawberries, rhubarb, sugar and lemon juice. Stir to coat and let sit for 2-3 hours, stirring occasionally. Place two saucers in the freezer. In a large saucepan, bring fruit to boil over medium-high heat, stirring occasionally. Use a hand-held mixer or immersion blender to puree the fruit until pretty smooth. Reduce heat and cook at a lively simmer until mixture begins to thicken, 20-25 minutes. To test for gelling point, drop one teaspoon of jam on one of the chilled saucers and put back in the freezer for about a minute. When you take it out, the jam’s surface should wrinkle gently when pushed with your fingertip. If not, keep stirring and heating and try again in another five minutes or so, then try again with the remaining saucer. Ladle hot jam into jars. Allow to cool and refrigerate for up to two weeks. I love the tip of pureeing the cooked jam! I usually leave mine stringy from the chopped rhubarb, but pureeing it would be far more elegant. Oooh I just knew that when you fed me something delicious this morning, it had to be on the blog somewhere. It was amazing, and I would definitely try making this! Thanks for sharing. We’ll have to get some more strawberries and rhubarb before the season is over…I want to preserve some! The jam sounds great. I still haven’t seen it in our markets yet…hopefully soon. Next mission is to make and preserve for winter! Any suggestions? I have made jam from a Japanese plum tree that we had. It was one of the long cooked jams that I then preserved in a hot water bath. 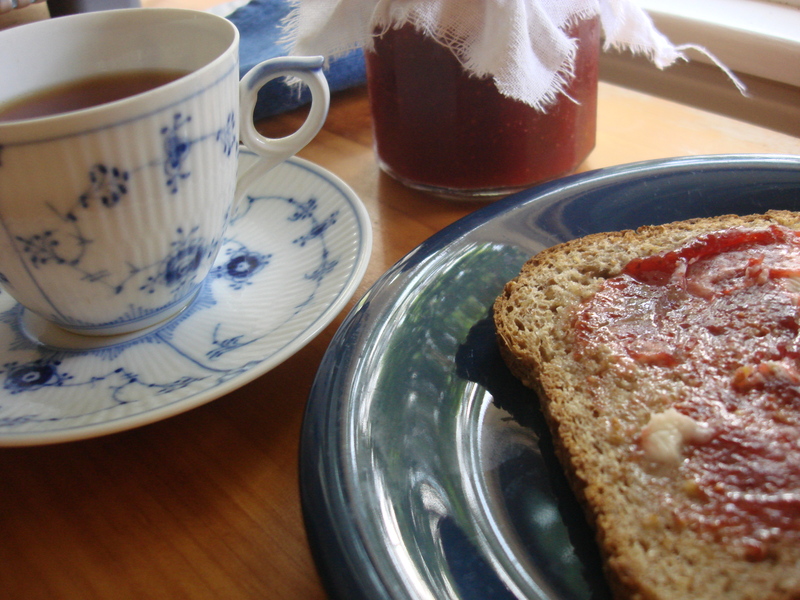 I made half of the recipe as normal jam…the other half I added red pepper flakes for a spicy jam. Both were delicious. An ice storm killed the tree but I had the lovely jam. Yum. It is strawberry-rhubarb season again and thanks to Restoration Farm I had some lovely fresh rhubarb that caused me to run to the supermarket and buy some (conventionally grown) strawberries. This recipe is bubbling up on my stove right now; it is so good (and so easy) it is worth a reblog! OHHHHHHH, That looks so good. And it makes me want on e of those pies. If you’re lucky, the boys haven’t eaten the whole jar I brought over yesterday…. !